Celebrate the lentil in the “Year of the Pulse” with Cauliflower Red Lentil and Potato Curry! Hope you all had a wonderful New Year’s celebration! 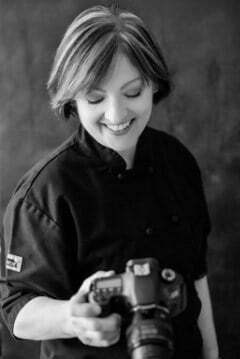 My deepest and sincere appreciation to all of you for your support, feedback and for following From A Chef’s Kitchen! Here’s to a great year ahead! Recently I’ve noticed a common theme in my Facebook feed and in other food-related stories: Predicted food trends for 2016. These food trend predictions are always fun to read. If I were seriously into keeping up with trends, I would look back every year at which took off and which were… Meh….not so much. Jumping-for-joy that molecular gastronomy and using liquid nitrogen to instantly and weirdly freeze things is now “yesterday’s news.” Never quite understood that whole thing! The predictions are all over the board, but one I’ve seen in numerous places is that lentils will hit it big this year. In fact, the United Nations has proclaimed 2016 to be the International Year of Pulses and established January 6th as a day to love and celebrate pulses. Besides lentils, pulses also include chickpeas, beans and peas. They’re a great, inexpensive source of protein. My Cauliflower Red Lentil and Potato Curry is a spicy and flavorful way to love and celebrate the lentil. Red lentils cook very quickly and practically melt into the dish they’re in. If using brown or green lentils (which take longer to cook), you’ll need to adjust the cooking time. My recommendation would be to cook them separately then add them to the dish at the very end. No matter which type of lentil you use, it’s always a good idea to look them over for odd-looking bits, stones and stems. I spread them out on a white paper plate to look them over then bend the plate to guide them into the pot. Now, you could go to the trouble of making your own curry spice blend, but I prefer to use a good blend such as the Madras curry from Penzeys. My Cauliflower Red Lentil and Potato Curry is the perfect recipe to play around with by varying or adding vegetables such as green beans or spinach, and for protein, chickpeas instead of potatoes would be perfect! Happy International Pulse Day, everyone! 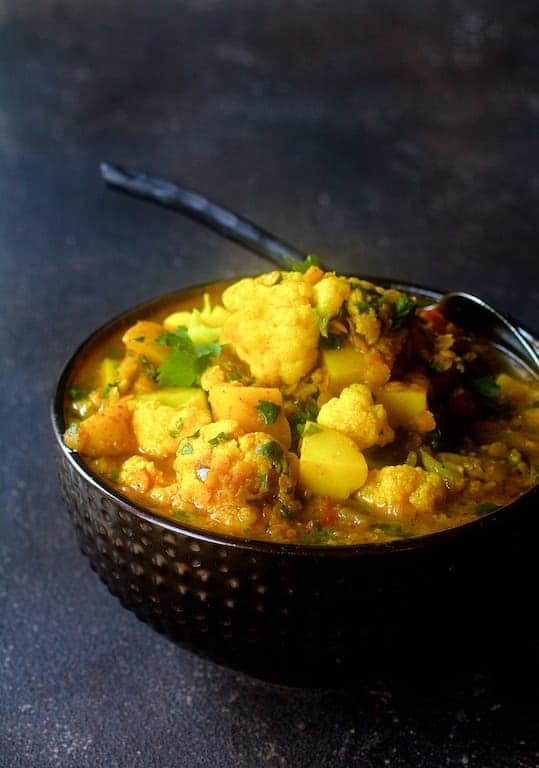 Celebrate the lentil with this Indian-inspired Cauliflower, Red Lentil and Potato Curry! Preheat oven to 375 degrees. Toss cauliflower with 2 tablespoons oil. Spread out on a baking sheet and roast until just tender, approximately 15 to 20 minutes. Meanwhile, heat remaining 2 tablespoons oil in a large, shallow pot over medium-high heat. Add the onion and pepper, reduce heat to medium-low and cook until tender, approximately 10 minutes. Add curry powder, ginger, garlic and stir 30 seconds. Add tomatoes, vegetable broth, red lentils and potatoes. Bring to a boil, reduce heat, cover slightly and simmer 15-20 minutes or until lentils and potatoes are tender. Stir in cauliflower and heat through. Add the cilantro and season to taste with salt and black pepper. MAKE-AHEAD: Can be prepared up to two days ahead. Heat on high in the microwave until hot, stirring halfway through. I made this curry for dinner last night and it was great! The roasted cauliflower adds a really nice texture. I followed the recipe exactly as written, other than adding 1 can of coconut milk in addition to the 2 cans of vegetable broth. The one issue I had was that the potatoes were not tender after simmering for 15-20 mins. It took about 45-50 mins of simmering for my potatoes to be fork tender. Next time I make this I’ll probably cook the potatoes a little before adding them to the curry so that it doesn’t take as long. Hi, Katie, Thanks so much and glad you enjoyed. 45-50 minutes to cook potatoes is a very long time! What size did you cut them? Yes, the potatoes could be cooked separately at a full rolling boil so they would not take that long. Thanks again! Loved this recipe! I was looking all over for a potato, lentil, cauliflower curry. My friend can’t eat bell peppers so I added grated carrot and frozen peas at the end of the cooking time. I also added 3/4 of a can of coconut milk and some Thai red curry paste and salt. I pulled the grated carrot idea your Vegan Thai Red Curry with Cauliflower and Potatoes. Lovely dinner light and flavorful with a touch of heat. I will make this again! Btw… your star rating system isn’t working or I would give this 5 stars! Thanks so much, Laura! I’m in the process of updating each and every recipe to a new format that also includes a nutritional analysis so yeah, what’s there may not be fully functional because of the old format. So glad you enjoyed and hope to get this recipe updated very soon! Thanks again! I made this tonight but I added a can of light coconut milk, amazing! Thank you for sharing. Hi, Francesca, Thanks so much for your feedback! This is a super-versatile recipe and I love when my readers make a recipe their own. I like to say that a recipe is simply a road map and how one gets to the final destination is up to them. Glad you enjoyed and please stay in touch!